Osaka is a company with a strong belief that coffee is not just a drink or a commodity, but a specialty. We couldn’t agree more. 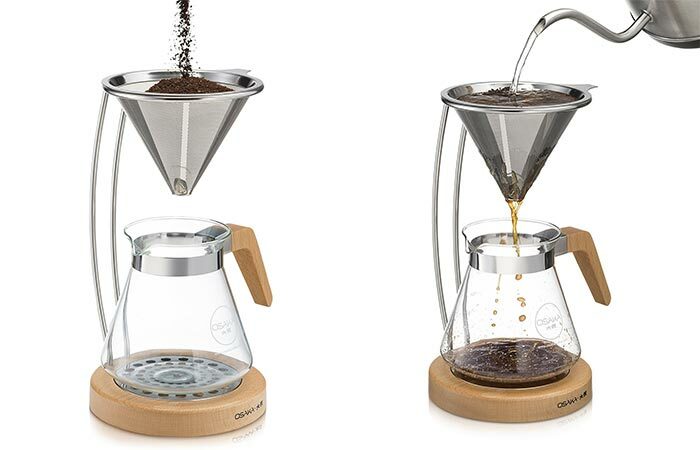 This Pour-Over Coffee Dripper has everything necessary to home brew your coffee in the old-fashioned drip way. Let’s start with the construction. 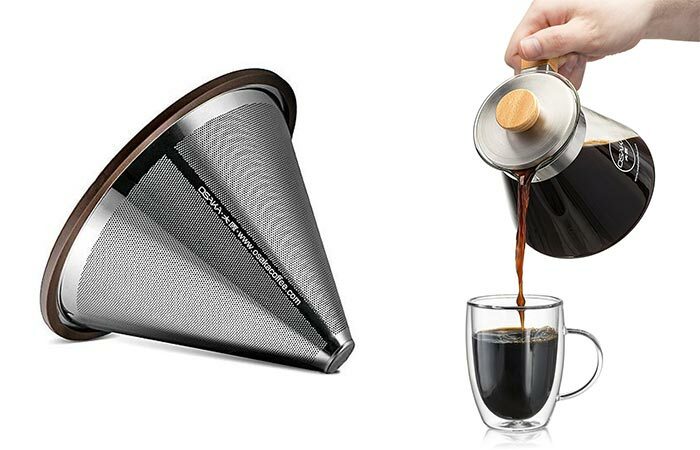 It has a stainless steel cone filter that helps extract the full taste of coffee beans. It comes with an additional mesh filter inside that’s very easy to clean and means you don’t have to bother buying paper filters and spending money. This coffee filter features a stainless steel cone filter, borosilicate glass server, and a wooden base. The server uses borosilicate glass that’s heat resistant and doesn’t attract any odors, chemicals or residue. This material is perfect for fresh tasting coffee. The server also has a nice wooden handle that matches the wooden stand. Speaking of the stand, the wood is treated so it’s water resistant and comes in three colors- black, natural, and mahogany. There’s also a stainless steel drip plate and grips on the bottom that keep the dripper stable. Step 1 and 2- add coffee beans and slowly pour hot water over them. 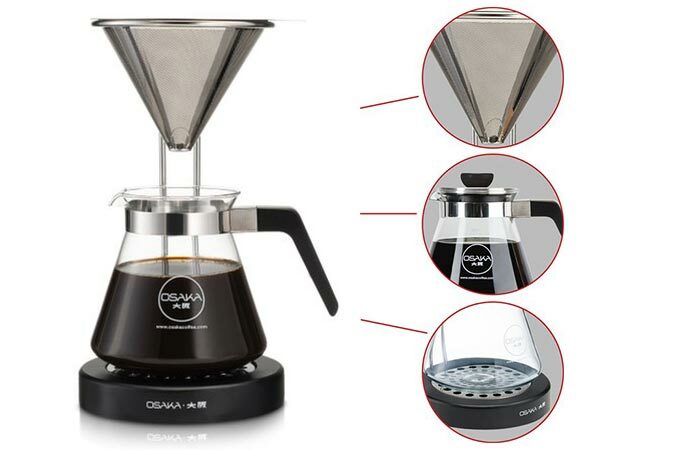 How to use the Osaka Coffee Dripper? Now that we’ve finished with the looks, here is how you use a coffee dripper like this one. First of all, you fill the filter with coffee grounds. Then you slowly pour hot water over it, ideally with the temperature being 195-200 F. When pouring water, have in mind that it’s best to slowly add more water and not just pour everything at once. After you’re done that, all that’s left is to wait for it to drip. For a 5-ounce cup of coffee, it takes approximately a minute and a half. The Osaka Coffee Dripper fills 2 cups. Step 3- wait for the coffee to drip.